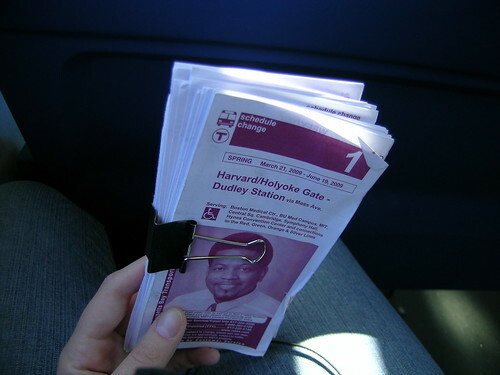 This entry was posted in Boston, transportation and tagged bus, buses, mbta, public transit. Bookmark the permalink. But have you heard this song? That song is PERFECT! 🙂 Thanks. Crossing the Mass. Ave. bridge on the #1, at dusk, with the Citgo sign blinking and reflecting off the Charles, and the tiny lights of the office buildings shining against the deep blue sky — that is an unparalleled experience, time and time again. But I also have a deep love for the #39, which took me from JP to Copley and back so many times, or to Brookline Village so I could walk to Trader Joe’s; and of course the #87, that took me to Union Square and Target and the Galleria before I owned a car; and the 86 that used to take me from Cleveland Circle all the way to Harvard Square; and even the 70 and 70A, which will transport me from work to Watertown in 20 minutes. In short, dude, I am right there with you. Even though I own a car. Yes, I’ve ridden that same #1 many times. Now, I’m that guy on the #8, from Kenmore to South Bay, every day for 4 years. The buses of Boston are always an adventure. Oh, and the buses have the added benefit of allowing you to exit when they break down. No sitting in the dark tunnel for endless amounts of time with no idea of what’s happened. You were born at the BI, yet you consider a visit to Forest Hills and Jamaica Pond an epic urban adventure? You sure you’re not a hipster transplant from some crap city like Seattle? Well, seeing as I lived in Florida from age 2 until college, during and immediately after college, the city was really new to me, and I appreciated routes like the 8 that opened it up to me. Also, it’s not that JP or Forest Hills specifically are bizarre destinations, but I like to create day-long journeys that often involve tromping from neighborhood to neighborhood, both on foot and by bus, and immersing myself in areas that I don’t get to visit regularly since I live north of the river and all. The “off the grid’ gallery I linked to chronicles a day where I walked nearly 9 miles from Forest Hills to MIT with several stops along the way. To me, by urban standards, that’s epic. Thanks for allowing me to justify my life to you. Riding the bus is one of my favorite activities. Living in New Orleans subways aren’t an option, but streetcars are. In my opinion the streetcar just doesn’t have the same appeal. I guess it’s because they are usually filled with tourist, which I’m fine with, but the people always change. On my buses, it takes four to get from home to work and back, I’ve gotten to know pretty much every regular rider on them. They’ve become like. . . . . family of sorts. When I miss a bus, that I normally catch, it upsets me. Not just because I will be late to where ever I’m going, but more because I miss the people I’ve gotten to know so well. Anyway, thanks for the post. It’s nice to know that I’m not the only person that loves riding the bus. No matter how hot, cold or long the wait may be, it’s well worth it to me.